“It is a nemotode (or Roundworm)” explains Prof. Boomker. “It is transferred from one host to another through various intermediaries, including the dung beetle, reptiles (such as lizards), birds, and even chickens.”A common scenario would be that a worm produces eggs which are excreted with faeces. A dung beetle would ingest worm eggs while working with and rolling these infected faeces. The eggs hatch, releasing larvae, which mature to the infective stage within the beetle. A dog may then eat the intermediate hosts, such as a bird or beetle, thereby ingesting the larvae. He believes there may be different reasons for this increase, but holds the personal view that it could be ascribed to the gradual but general increase in urban decay and unsanitary conditions in certain areas, and the associated accumulation of refuse. This degenerating level of hygiene poses general health risks, and could certainly contribute to an increase in the spread of many diseases and parasitic infestation, including that of Spirocerca lupi. Once the dog has eaten a beetle or other intermediary carrying larvae of Spirocerca lupi, the larvae are released within the dog’s stomach during the digestive process. 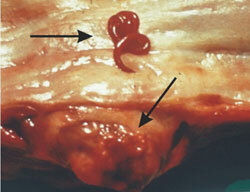 The larvae reach the aorta (the main artery in body) via small arteries that drain the stomach. In the main artery they mature, a process which takes about three months, after which they pass through the wall of the artery into the wall of the oesophagus. In the oesophagus wall they form a swelling, known as a granuloma, in which the worms live. As the worms grow bigger the granuloma grows bigger. This growth can result in pressure on the windpipe, pressure on the aorta and occlusion of the oesophagus. “Where such a granuloma has formed on the oesophagus a partial blockage and/or irritation would cause breathing problems, wheezing, coughing, and the dog may also vomit shortly after eating”. It should be remembered that these are symptoms that could be associated with many other unrelated health problems and pet owners should not panic and automatically assume the dog has Spirocerca lupi. Nevertheless, if in doubt, a veterinary surgeon should be consulted. There are certain very serious and life-threatening secondary problems. A granuloma on the oesophagus would cause difficulty in breathing and swallowing. “In long-standing cases, the granuloma can become cancerous. In such cases it can either remain in the oesophagus and become a fibrosarcoma, or spread to the long bones in the body (i.e. the tibia, femur, radius, ulna) and form an osteosarcoma, which is not easily treatable,” he points out. If the worms have damaged the wall of the aorta (main artery), a weakening can occur that develops into an aneurism. If the damage is not too extensive, aneurisms form and months could pass before they rupture; they may also not rupture. However, in the event of extensive damage to the aorta, the aneurism could rupture or burst, causing the death of the dog within minutes due to massive bleeding. Unfortunately, in the majority of cases, current available treatment is usually not effective. This is because diagnosis is usually made only when clinical signs indicate the existence of a problem. By this time, the granuloma will be quite large and there is a high chance that it has already become cancerous. There are remedies available, which are always administered and supervised by a veterinary surgeon. These are known as macrocyclic lactones; however, it must be emphasized that they should not be used on Collies or Collie crosses, which are highly intolerant of macrocyclic lactones. Is Spirocerca lupia “Dog Disease”? However, Prof. Boomker has seen a lion from the Krugersdorp area with Spirocerca lupi; and as we go to print, a case of a Red Panda from the Vaal Triangle was reported. 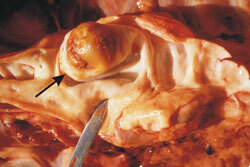 “It died of rupture of the aorta and a granuloma was present in the oesophagus. Samples of the worms were provided by the veterinary surgeon and Spirocerca lupi was positively identified,” says Prof. Boomker. Maintenance programmes for good hygiene and cleanliness of the area where the dog is housed and exercised should always be followed. As is the case with the majority of worms, however, standard disinfection is not always effective due to the indestructible nature of both egg and larvae. “It must be emphasized that by far the most important preventative measure is the regular removal and appropriate disposal of faeces, which is essential to minimise the chances of infection. “Faeces should be disposed of in a manner that ensures they are not accessible to dung beetles, birds, reptiles and other intermediaries which can spread the larvae of this parasite,” advises Prof. Boomker.